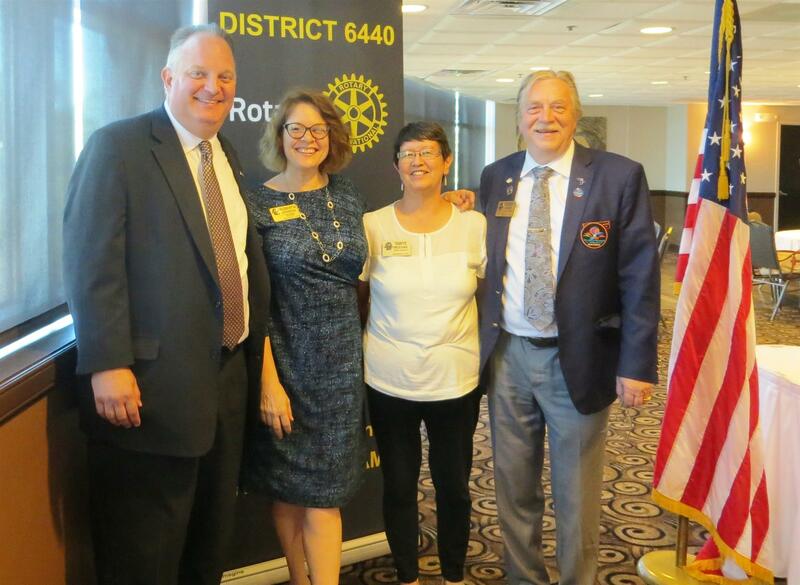 Our new District 6440 Governor, Rodney Adams from the Mt. Prospect/Prospect Heignts (MPPH) Club, dropped by on July 30 to meet our board and let us know what plans the District has for the 2015/2016 year. Part of Rodney's mission has been to get all the clubs entering their membership, goals, speakers, and events online so they can easily be shared throughout the District clubs He also encouraged us to explore social medis more thoroughly, explaining that although this activity may not bring us new members, it effectively raises our profile in the community and beyond. Left to Right: Steve Pokrak, Roberta Johnson, Tamiye Meehan (AG for the District) and Rodney Adams. It's great to see someone with so much energy and enthusiasm heading up our district!